Rare opportunity, 5 acres on Alii Drive! Attached paperwork to listing shows how property can potentially be used while zoned as Ag with county approval and appropriate permits. Property has the potential to be rezoned for condominium development and other uses. Archeological review completed in past year by Dr. Alan Haun. Interior Features Room for future large home with privacy from street. 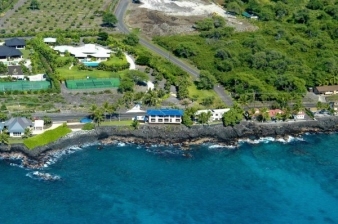 Walk from your gate and across the street to swimming, snorkeling, surfing and the best beach in Kailua-Kona for body surfing or boogie boarding. Exterior Features Fee Simple Zone A-5A across street from ocean side Pahoehoe Park or walk a few more feet to access magical White Sands Beach. Additional Features and Amenities Room for future large home with privacy from street. Walk from your gate and across the street to swimming, snorkeling, surfing and the best beach in Kailua-Kona for body surfing or boogie boarding. Archeological study completed. Borders Hoomaluhia Road on north with over 261' of Alii Drive frontage. Private acreages are adjacent to east and south sides of property. A small private residential lot "cutout" of 4,791 sqft on Alii Drive side of property which is fenced off from subject property. The site is approximately 11 miles south of Keahole-Kona International airport and slightly over 3.5 miles from downtown Kailua Kona HI. Property has lovely rock walls on Alii Drive side of property. There is a wire cross fence in the approximate central portion of the property. Please look at attached Preservation site map for additional information.